Omas 18k Gold 2-Tone Nib Oblique Medium Limited No 6. Our products are 100% Mint, genuine and arrive with original worldwide guarantee. We give our buyers best quality, best price, and best service! All customers located in Israel have to add 17% VAT by law. Thanks for shopping with us! The item "Omas 18k Gold 2 Tone Nib Oblique Medium Limited No 6 Mint Very Rare" is in sale since Wednesday, November 4, 2015. 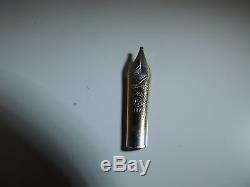 This item is in the category "Collectibles\Pens & Writing Instruments\Pens\Fountain Pens\Omas". The seller is "pens-attraction" and is located in Tel Aviv. This item can be shipped worldwide.